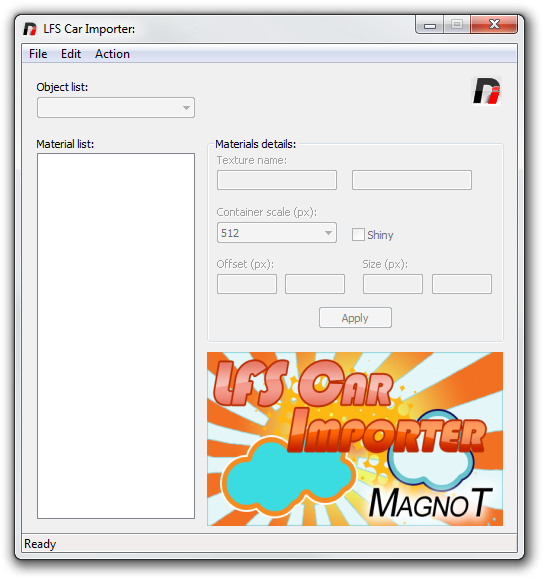 LFS Car Importer is a freeware software created by MagnoT. This tool is necessary to successfully import car models to Live For Speed (Patch Z currently). It not only imports cars but lets you manage several things related to LFS car models. This software is at disclosure free of charge. It was developed and licensed to users under the name 'LFS Car Importer'. The user, as Licensee, can not redistribute or sell it. This software does not offer danger to the final user. It does not collect any kind of data or information. If you need more information please contact the developers of LFS Car Importer (MagnoT), or check out their product website.